One of the biggest headaches for parents having a second (or third, or more) child is the potential rivalry that may crop up. The fantasy is that everyone will love each other and not every fight or argue. 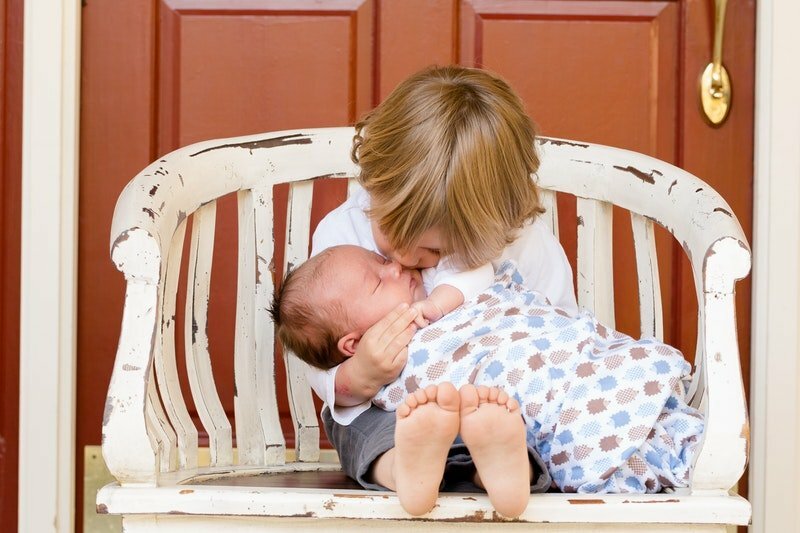 The reality is that sibling rivalry happens, but there are certainly things moms and dads can do to help ensure that it stays at a healthy – not horrific – level. For most toddlers, having a new baby brother or sister on the way is an abstract thought that usually starts off as a happy one. They imagine that getting a new sibling is a lot like getting a new toy, with the baby at their beck and call as a fun plaything. The thought that the new baby means a division of everything, including your attention, isn’t something that occurs to them naturally. It is critical to prepare the soon-to-be older sibling(s) for what life will look like once the new baby arrives. This doesn’t need to be a direct conversation, especially with a toddler. Instead, use books like “My New Baby,” by Rachel Fuller for little ones or “The New Baby” by Mercer Mayer for older kids to support their understanding about what’s going to happen once the baby comes. This shows them that although things will be different, they also get the wonderful opportunity for a close, new relationship with their new sister or brother. And perhaps the most important thing you can do is invite your child into the process of preparing for the new baby. Let him or her snuggle to your growing belly and feel the baby’s kicks. Ask your child’s opinion about the new baby’s name and consider setting a daily schedule to sing a song or read a story to the new baby in your tummy. All of these ways help support your child feeling bonded with his or her new sibling. Once the baby arrives, an important way to minimize sibling rivalry is to maximize your old child’s feelings of purpose and importance. After all, your child now can see that everything – including mom and dad – are shared. The baby demands your attention, but doesn’t have an awareness of his or her sibling. This reality may stir up in your older child feelings of anguish, anger, and frustration. One way to counteract this is to assign responsible and important roles to the older sibling. Why not suggest he or she help you with a diaper change? Or sit with you while you breastfeed the baby to keep you both company? Look for ways to ask for the older child’s assistance, even for something small, to help him or her feel necessary and involved. Teaching your child to feel a sense of responsibility, and even the role as his or her sibling’s protector, can go a long way in fostering a bonded, caring relationship. While it might not be intentional, comparing one sibling to another can be an easy trap for parents to fall into. On the one hand, each child is different from the other, each with his or her strengths and weaknesses. On the other, your older child may be especially vulnerable to feeling like you like the new baby “better.” So even if baby rolls over, says the first word or walks sooner, be mindful not to make it feel like that’s preferred – it’s just different. Your goal should be to equally praise positive aspects of your children, and talk about where improvements can be made, too. One of the main causes of sibling rivalry is shared parental attention. While newborns take up much of your time, be mindful to take advantage of those times when you can give your older child undivided attention. For example, try to wake up and spend with your older child a half hour earlier, or spend a half hour alone with him or her after you put the baby down for a nap or bedtime. In reality, your family is a team for which all members play. This is one of the main areas that should work with your children. It’s on you as the parent to teach your children the importance of cooperation, teamwork, dedication and sharing. If your children see their siblings on multiple levels, as a family member, friend and teammate, it’s much easier to kick those rivalry feelings out of bounds. The bonds you help your children create today are the building blocks for a lifelong, loving connection.